contemporary images and reluctances about this image given to us by the Fourth Gospel’s inspired author. Seeing it in the context of the entire chapter as well as surrounded by the Psalm Response and the First and Second Reading we can come to appreciate the image as having a very deep message for us. celebration psalm. This was taken up by the early Christians as one of the most cited of psalms in the New Testament as well as one that is frequently recalled during this Easter Season. We see Jesus as the keystone and the exemplary pastor in the readings from John and from this excellent psalm 118. It is especially the final ten verses of it that are heard often during this time of joy, peace, and exultation at the event of Jesus’ rising from the dead. process in the life of a Christian dedicated to bringing about the kingdom of God. The second part of the chapter is dedicated to this more personal relationship dimension in the life of the exemplary shepherd to his sheep. Listening, recognizing the living voice of Jesus is brought about by our following him wherever he goes and leads us. 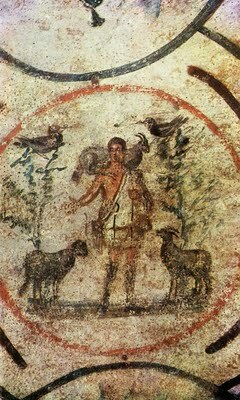 Verdant pastures lie ahead for us as we are not only following this exemplary shepherd but actually participating in his very life through the sacraments of Easter—Baptsim and the Eucharist. We follow, we listen, we are attentive, we feel his concern and care for us. We come to realize he is the exemplary model for leadership and mission. Peace, joy, and exultation are ours when we become like him. Amen. Do you know the Shepherd?